Vertigo is a feeling of spinning or whirling when you are not moving. It can also be an exaggerated feeling of motion when your body is still. Vertigo is different from passing dizziness or light-headedness. Inner ear nerves and structures sense the position of your head and body in space. Vertigo is often caused by problems with these nerves and structures. Labyrinthitis is swelling and irritation of the inner ear. This often follows an upper respiratory infection, like a cold. 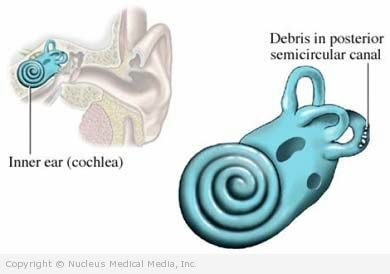 Meniere’s disease is caused by a fluid buildup in a part of the inner ear. This vertigo usually occurs along with hearing loss and tinnitus (ringing in the ear). Acoustic neuroma (acoustic schwannoma) is a slow-growing, noncancerous tumor of a nerve to the ear. The tumor can press on the nerves responsible for hearing and balance. This can lead to hearing loss, tinnitus, and vertigo. This is a common type of tumor in people with a hereditary tumor condition called Neruofibromatosis type 2 (NF2). Decreased bloodflow to certain area of the brain may also cause vertigo. Blood flow may be reduced by atherosclerosis (deposits of fat in the arteries) or other causes of narrowing of blood vessels. It is usually accompanied by other nervous system-related symptoms. Many cases of vertigo occur with nystagmus. This is an abnormal, rhythmic, jerking eye movement. Other symptoms depend on the condition causing the vertigo. Symptoms do not occur when the head is held still. Sudden, intense vertigo that lasts for several days to one week. Often occurs with nausea and vomiting. Sudden vertigo attacks last between minutes and hours. They typically occur with prominent hearing loss and tinnitus. Vertigo due to BPPV, labyrinthitis, or vestibular neuritis may go away on its own. They usually go away within six months of onset but some may take longer. Semont maneuver — The patient is moved rapidly from lying on one side to the other (also called liberatory maneuver). Epley maneuver — This maneuver involves head exercises to move the loose particles to a place in the ear where they won’t cause dizziness. If you continue to experience vertigo, the maneuvers can be repeated, or more difficult maneuvers, such as Brandt-Daroff exercises, can be done. Physical therapy can also be helpful. Surgery may be considered if symptoms last for a year or more and cannot be controlled by the maneuvers. A surgical procedure called canal plugging may be recommended. Canal plugging completely stops the function of one part of the ear without affecting the functions of the rest of the inner ear. This procedure poses a small risk to hearing. Vertigo can be a symptom of another medical condition, such as a heart problem or a neurological problem. Once that condition is treated, vertigo should stop, or, in this case, the underlying medical problem should be treated to help relieve the vertigo. If your vertigo is due to Meniere’s disease your doctor may also recommend a low-salt diet. Avoid sleeping on the bad side of your head. In the morning, get up slowly. Sit on the edge of the bed for a minute before standing. Be careful at the dentist’s office, hair salon, sports activities, or positions where your head is flat or extended.